"You are to become natural Christs. You are to communicate to the world its potential to restore the Earth, free the people, and impregnate the universe with new life. You are to participate in the Instant of Co-operation, the Planetary Birth, the Second Coming. "You are to bring on the shared contact with me. You are to ascend to the New Jerusalem. You are to overcome physical death. You are to be in touch with your universal brothers and sisters. You are the first sons and daughters of humanity to become the Sons and Daughters of God, as a new norm." Ed. Note: The article below is Part IV of a 1995 6-part series called "The Laughing Phenomenon," by Ed Tarkowski. * It was originally published in The Christian Conscience magazine in the Herescope column. Tarkowski's article was a 6-part series that covered the history of the "laughing revival" at Toronto. The entire series provides a close scrutiny of the busy activities of John Wimber during this era after he had connected with the "Kansas City Prophets" movement (now IHOP and its many offshoots). This article is being run without any links, but for those who are our regular readers, you'll notice the remarkable parallels to current posts we have run the past several years. "Birthing" is becoming a common term in the Laughing movement. In Part II of this series, we discussed prophecies of a fresh new revelation of God's impregnation of the Church, followed by a period of gestation and the birth of "Isaac." In Part III, we pointed out the connection between "Isaac" and the Latter Rain's replacement of Jesus with the Church as the seed of the Abrahamic Covenant. As well as bringing the Covenant "blessings" to the nations through the Toronto Blessing, that seed's celebration of Tabernacles will result in the unity necessary to manifest the Sons of God. In turn, they will establish the Kingdom and cleanse the earth of evil (eliminating the Tribulation period) so Christ can return. All of this is disturbing, to say the least. By the use of Replacement Theology, Latter Rain sees the Church as the "New" Israel inheriting all of God's promises to Abraham. Israel has no more part to play in the endtime scenario, except as it becomes part of the New Breed, the one New Man to be birthed through the Church: the Manifest Sons of God. Barbara Marx Hubbard's New Beginnings are based on the evolution of man into godhood, and the newly energized Latter Rain movement is bringing this evolutionary model into the Church. The only differences lie in the outworking of the concept. In the Latter Rain doctrine, man must first receive Christ and then mature to the point where he incarnates Him. In Hubbard's version, man is born a god, and must only come to a realization of the fact. This may seem to be a point of contention, but in the grand scheming of the Deceiver, it's merely an example of his principle that "the end justifies the means." The end is Eden revisited, and the adversary still has the same motive in mind: to get man to believe that "Ye shall be as gods." "If you buy the restoration concept, it inevitably sets up for the evolutionary church concept, a deluding, intoxicating idea that makes the current expression of the church feel that she is the ultimate center of God's purposes, over and above all other expressions of the church. "Think about it. If restoration and Latter Rain is true, that means we are more anointed and equipped and more powerful than any other church in history. It is a fact of Scripture that when a person receives Christ, he receives a share in the fullness of Christ which makes him complete, although always short of godhood (Colossians 2:9-10). Each member is vitally united to Christ by the Spirit through faith in Christ's finished work. But Latter Rain teachers say otherwise, calling for much more than just following the Holy Spirit. Theirs is a call to godhood realization, where God fully indwells the Christian and makes him the ongoing incarnation of Christ. It is this state of maturity which will bring about the manifestation of the Sons of God and set creation free from corruption. Hubbard's teachings say the same things, although they're couched in different words. In the first 3 parts of this series, we've discussed the impregnation, gestation and birth of "Isaac." But what this process does to the Church is place it in the evolutionary model of the New Age. In a like manner, the Church's move through the Feasts of Atonement, Pentecost and into Tabernacles is an evolutionary process. Latter Rain teaches that Christ Jesus comes to the individual at Pentecost only to incorporate him into the unity of the Army of Sons formed in Tabernacles. The evolutionary model was evident in the 1980s restoration teaching which lead up to this laughing "revival," i.e., the restoration of the apostles and prophets, their "new" revelations, the new wave of signs and wonders, power evangelism, individuals "progressing" into a maturity pleasing to God, men overcoming death in the physical realm, and finally, the Church conquering the world for Christ and reigning as Him on earth. Now the laughing phenomena connected with the Feast of Tabernacles has become the driving force behind the Church's move toward Christification. But the key to Latter Rain realizing its goals is the evolutionary birthing process itself. This is New Age philosophy, Christianized to make it palatable to the Church. "This tiny band, this brave congregation, of souls attracted to the future of the world are my avant garde - the New Order of the Future. "I call upon you to activate the capacities to save the world from self-destruction. I call upon you to undertake a mission comparable to the first disciples of Jesus. They were the first to carry the message of the reality of our potentials to the nations. You are to be the last to carry the message. If one equates "Laughter" being released in nation after nation with the New Age planetary body being filled with ecstatic joy, then this aspect of both moves are the same. Ecstatic and uncontrollable joy - An irresistable force flooding people's systems - Billions of members - Was this Toronto and the global laughing phenomena based on Latter Rain? Or was it Hubbard and the New Age Christ? It was obvious; it was both - it was the same. Beginning this year , the dual agendas will begin to be implemented, so the Church must prepare itself in order to warn others who are taking their stand for our Lord Jesus Christ. Below are the distinctive doctrines of the Latter Rain (see fuller doctrine in Part II), each followed by excerpts from Barbara Marx Hubbard's book, The Revelation: Our Crisis Is A Birth. Familiarize yourself with this doctrine so you can recognize it and share it with others. The New Age and Latter Rain scenarios will soon be meshing, as the apostate Church continues on its way to destruction. Remember that the terminology of the teachings may differ, but the end result is the same. For example, Latter Rain calls the incarnated person a Manifest Son of God, while the New Age says he is Christed, the Universal Human, or Homo Universalis. The same idea is true regarding "immortality." In the Latter Rain, there is a "fresh" receiving of the "Holy Spirit" and then maturing into Christ until one becomes immortal. But in the New Age, the seed of immortality is said to be already present at birth and must only be realized. These are two different means to immortality, but the adversary's desired result is the same: "godhood." The end, therefore, justifies the means. The devil has always changed the names and ways of his deceptions, but the goals and purposes he set for himself in the Garden continue. As in Latter Rain, there is a gathering together that unites everyone into one corporate body. In Latter Rain, Christ is the Pattern Son, and Hubbard's Christ is a model. The "millions of members" spoken of below by Hubbard is complimentary to the Latter Rain revival, which leads to the incarnation of Christ in humanity. And, as does Latter rain, Hubbard's philosophy based on a Cosmic Christ also says now is the time for the harvesting of the earth. We have shown the similarities of the birthing process in both the New Age and Latter Rain movements, leading to the birth of a corporate body that will transform the earth. This is an interesting quote because the word from Toronto about a coming Civil War in the Church attributes those opposing the move to relying on their "intellect and individuality." These are the "grays." It is through this Civil War that the grays will be eliminated and the Blues selected as the ones to establish the Kingdom after this War. There is little or no difference between this and what Hubbard's Christ stated in the last quote. D. RESTORATION: The restoration of the offices of Apostles and Prophets. These would bring about the perfection of the saints. Both movements are prophesying a birth on a global basis, a joining together being brought about by the prophets of both moves. E. REVELATIONS: The new, progressive or evolutionary revelations of the Latter Rain Apostles and Prophets. "The text" referred to here is Hubbard's book, The Revelation, which is the second part of a work entitled, The Book Co-Creation. It in itself is about 350 pages of new revelations from a spirit who says he is Christ, revelations being given to humanity through the New Age prophets. Faith and knowledge undergird both moves, but it is a faith and revelatory knowledge that denies the truth of Scripture. F. IMMORTALITY: Latter Rain teaches death is overcome by the Manifest Sons, who attain immortality by incarnating Christ before His return. It is important when considering this Hubbard quote to remember the End-Justifies-The-Means principle we spoke of earlier. G. UNIFICATION: Church unity on a global basis is absolutely essential to Latter Rain doctrine, because Christ cannot incarnate in a divided body. It is also essential Hubbard's move toward world unity. See earlier quotes. H. ESCHATOLOGY: The changing of the physical body, which brings immortality to the adherents of both Latter Rain and the New Age philosophy, is key to both movements. Incarnation of Christ in the person is said to bring about the revelation of the corporate Christ. As in Latter Rain, a kingdom is established which is ruled over by a humanity which has reached its purpose: godhood. the earth is made a footstool for His feet. Latter Rain discounts the classic understanding of the Second Coming and its events. I. RELIGIOSITY: The religious "Old Generation" will either be destroyed by the Manifest Sons or "converted" by the prophets. "The Instant of Co-operation begins, empathy floods the feelings of the whole body of Earth, separateness is overcome, and I appear to all of you at once. I appear to you from within as a voice, and as a vision of yourself as an evolving being. I appear to you from beyond as the light being that I now am. Your electronic media will pulse with light - the same light your mystics see. "The promise I made is of a personal future in a transformed body. This means that you will also have what I have now. I am real. I am tangible. I am alive. I can speak to each of you through your inner ear if you listen. I can appear to each of you through your inner eye if you look. "At the moment of cosmic contact, I will appear to you both through inner experience and through external communication on your mass media - the nervous system of the world. "You will all feel, hear and see my presence at one instant in time, each in your own way. Though the New Age was virtually unheard of when Warnock published his book in 1951, this evolutionary model is now the norm among the New Age futurists who believe, along with the Latter Rain and its rejoicing, celebrating followers, that the human race as a whole is birthing the next stage of man's evolution: Godhood. "Then if any man shall say unto you, Lo, here is the Christ, or there; believe it not. For there shall arise false Christs, and false prophets, and shall show great signs and wonders; insomuch that, if it were possible, they shall deceive the very elect. Behold, I have told you before"
(1) John Wimber, "Seasons of New Beginnings," File NEWBEG.TXT, 23879 Bytes, Compuserve, CIN-4, Lib 2. Originally published in the May/June 1994 edition of Vineyard Reflections newsletter published by Association of Vineyard Churches. John Wimber, Publisher; Bill Henderson, editor. (2) Barbara Marx Hubbard, The Book of Co-Creation: The Revelation - Our Crisis Is A Birth, "The Christ" comments on Rev. 10:8-11 (Novato, CA: Nataraj Publishing, 1993), p. 158. (3) Ibid., "The Christ" comments on Rev. 10:1-4, p. 150. (4) Pastor Bill Randles, Weighed and Found Wanting . . . Putting the Toronto Blessing in Context, 1995, pp. 57-59. (6) Barbara Marx Hubbard, Teachings From The Inner Christ for Founders of a New World Order of the Future (A Work In Progress) - A Complement to The Book of Co-Creation, "The Lineage of Founders of a New Order of the Future" (Greenbrae, CA: Foundation for Conscious Evolution, 1994), p. v.
(7) Pierre Teilhard de Chardin, Hymn of the Universe, (London: William Collins Sons & Co. Ltd., and NY: Harper & Row, Publishers, Harper Torch Books, 1965), p. 93. (8) Pat Robertson interview with Judson Cornwall, 700 Club, Family Channel, June 9, 1994. (9) Hubbard, The Revelation, "Planetary Birth Experience," p. 37. (11) Ibid., Prologue, "The Christ" comments, pp. 13-14. (12) See Part II, prophecy segment on the birth of the corporate child. (13) Ibid., "The Christ" comments on Rev. 22:6, p. 290-291. (14) Randles, p. 65 citing Earl Paulk commenting on the incarnation on Morris Cerullo Video, 1991, "Manifested Sons Of God." (15) Hubbard, The Revelation, "The Christ" comments on Rev. 21:4, p. 253. (16) Master Potter, Prophetic Insights For The '90's: Quarterly Perspectives from Jill Austin, "The Great Intruder" Passion & Fire Conferences, Summer '94. (17) Hubbard, The Revelation, describing what she saw while in a dreamlike state, p. 39. (18) Cassette tape of Alan Vincent service, 1994. Location unknown. (19) Hubbard, The Revelation, "The Christ" revealing the aspects of the soon-coming Planetary Birth, p. 234-235. (20) Ibid., "The Christ" comments on Rev. 7:9-17, p. 141. (21) Nancy Flint, personal eyewitness testimony, Seattle Fire & Reign Conference, Seattle, WA, February 14-17, 1995. (22) Hubbard, The Revelation, Hubbard comments on "The Theater For the Future," pp. 53-54. (24) Hubbard, The Revelation, "The Christ" comments on Rev. 7:9-17, p. 141. (25) Quote from Rodney Howard-Browne, often heard during his meetings. (26) Hubbard, The Revelation, Hubbard comments on "The Inner Voice Awakens," pp. 31-32. (27) Ibid., "The Christ" comments on Rev. 7:1-4, p. 139. (28) Ibid., "The Christ" comments on 1 Cor. 15:45, p. 164-165. (29) Ibid., "The Christ" comments on Rev. 3:9, p. 104. (30) Ibid., Hubbard comments on Rev. 4:6, p. 117-118. (31) Ibid., "The Christ" comments on Rev. 20:4-5, p. 237-239. (32) Ibid., "The Christ" comments on Rev. 20:1-3, p. 231. (33) Ibid., "The Christ" comments on 1 Cor. 15:45, p. 165. (34) Ibid., Hubbard comments on Rev. 12:3-4, p. 174. (35) Ibid., "The Christ" comments on Rev. 10:8-11, p. 159. (36) Ibid., "The Christ" comments on A New Order of the Future, p. 64. (37) Ibid., Hubbard comments on Rev. 4:8, p. 118-119. (38) Ibid., "The Christ" comments on Rev. 19:6-8, p. 218. (39) Ibid., Hubbard comments on Rev. 20:1-3, pp. 235-236. (40) Ibid., "The Christ" comments on Rev. 19:14-16, p. 226-227. (41) Ibid., "The Christ" comments on Rev. 3:13, p. 106. (42) Ibid., Hubbard comments on Rev. 8:7-9; 9:1-4, p. 145-146. (44) Hubbard, The Revelation, "The Christ" comments on Rev. 20:1-3, pp. 236-237. *Ed Tarkowski, "THE LAUGHING PHENOMENA: Its History and Possible Effects on the Church: Part 4: Laughing: Deeper Realities," The Christian Conscience, May 1995. Some minor formatting and textual changes were made for the purpose of blog posting. The article is also published online at http://www.deceptioninthechurch.com/Laugh4.html. For the other articles in this series by Ed Tarkowski, see http://www.deceptioninthechurch.com/Laugh1.html, http://www.deceptioninthechurch.com/Laugh2.html, http://www.deceptioninthechurch.com/Laugh3.html, http://www.deceptioninthechurch.com/Laugh5.html, and http://www.deceptioninthechurch.com/Laugh6.html. Ed Tarkowski has many articles published online that give very important history on the background, history and theology of what is now called the New Apostolic Reformation. Should the Lord permit, we will endeavor to scan in some of the original articles that ran in The Christian Conscience magazine, with sidebars and illustrations, and post them online at the Discernment Ministries website in the future. For more information about Barbara Marx Hubbard, see Warren B. Smith's book False Christ Coming at http://www.mountainstreampress.org/books/. **ANSWER: Barbara Marx Hubbard's "Christ", The Book of Co-Creation, pp. 290-291. Did you think it was one of the New Apostolic Reformation prophecies? Notice the similarities?! We regret to inform the peoples of the Earth that there has been a disturbance in the Force. 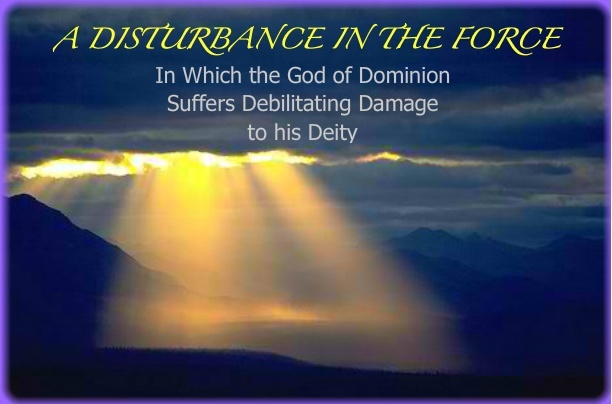 Events unforeseen have occurred which have caused immediate and irrevocable damage to the Almighty. 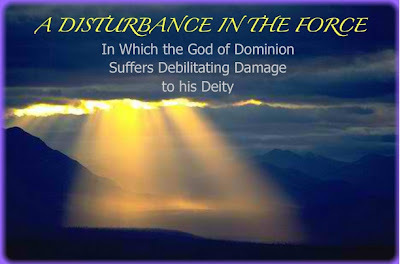 The Ad Hoc Throne Committee has completed an initial survey of the disaster and reports that God’s attributes have sustained significant injury to His Being. On the positive side, we report the following attributes of God appear to be intact: Eternal, Righteousness, Faithfulness, Goodness, Mercy, Justice, Love, Holiness and Incomprehensibility. On the negative side, we have located a power failure in the following Almighty attribute grids: Omnipotence, Immutability, Omniscience, and Omnipresence. Truth and Grace are in the workshop in an attempt to salvage some aspects of these attributes. In short, the Almighty God the Father has sustained irreversible damage during a critical phase on Earth known as the Latter Days. The Alpha and the Omega has been abridged to lower-level functioning as Alpha and the Omicron. Due to this emergency, a Strategic Planning Committee has been set up to conduct trouble-shooting, engage in long-range planning, and launch a transformational initiative upon planet Earth to ensure the Almighty’s Plan for the Last Days is fulfilled according to His timetable. We acknowledge that this timetable has been kept a secret, and that given the damage done to Omniscience we are collaborating with the heavenly angels, the 4 beasts, and the 24 elders who are before the throne in an attempt to piece together this chronology. We ask your forbearance as we engage in this phase of sustained reconstruction. To meet the needs of the body of Christ on Earth, particularly regarding the missing attribute Omnipresence, we have instituted production quotas via a computer simulation which will assist the organizational development of transformative innovation. Change can be difficult. Special forces and enhanced capabilities will ensure that coalition strength is maintained throughout this difficult transition. Collaboration is key to the success of this effort. Should you need further assistance with the fulfillment of your prayer requests and petitions, we refer you to the World Prayer Collection Archive where each and every prayer request is databanked pending the Almighty’s future recovery. Our most recent records indicate that there has been a corresponding disturbance in the Force which has profoundly damaged the Church on planet Earth. We request immediate corrective steps be taken to compensate. Beware: traditional methods of operation have been highly counterproductive to the achievement of future goals. Changes must be implemented immediately. Souls are being lost! Our surveys have found a disturbing depletion of the following “fruits of the Spirit”: peace, longsuffering, gentleness, meekness and temperance. The Committee has been working overtime and has now discovered a method of manufacturing fruits. Orders will be filled shortly. Love, joy, goodness and faith appear to be slightly altered, but primarily intact. In the meantime, we have issued ration tickets for these fruits pending a comprehensive assessment of their effectiveness. Finally, it is requested by our Strategic Planning Committee that all references to the “works of the flesh” be immediately omitted from future sermons, as these are apparently creating some cosmic disturbances. Additional instructions will be forthcoming. We have completed our damage assessment. Effective immediately new standards have been issued for personal living. These standards have been significantly revised for the sake of clarity and uniformity. Old standards can be discarded, as they are considered obsolete. Due to concerns about potential local disruptions, the Revised Standards for Personal Living comes in the same packaging as the old, which should ensure that the replacement process will go more smoothly. Your personal copy of this document will be issued shortly. As an additional precaution, we have located several facets of the missing attributes of Vengeance and Judgment and will immediately make them available to maintain the civic order while these standards are being instituted. Each allotment of these attributes will be doled out to Earth Leadership who fit the following criteria: 1) successful completion of the accredited leadership training course through the Global Shepherds Network, or 2) special anointing as Apostle or Prophet. There appear to be some slight irregularities with Mercy, but we believe that compensatory steps can be taken to overcome this lack. Also, on a related note, we have received numerous complaints about the unreliability of the old system of communications, so a new and better replacement has been invented. Each morning a personally edifying ourascope (heavenly report) will be issued through instant text-messaging to Earth Leadership. No more uncertainties and vagaries about heavenly intentions! No more difficulties divining the heavenly Will. Prophets, please make sure that your group receptors are set on “high.” Thank you for your cooperation. A glitch in our mainframe hard drive indicates that at some point in the history of mankind a worm virus entered the operating system. Both the Old and New Covenants appear to have been compromised. The source for this infection is still being investigated. Given the on-going, unresolved difficulties in the Omniscience power grid, we have rushed to establish a temporary covenant collection site. A special archive for signatures has been set up at hhh.signupnow.com. Various menu options are available to accommodate denominational preferences. Transformation – the measurable supernatural impact of the presence and power of God on human society, sacred and secular. In the church, this is characterized by increased holiness of life, accelerated conversion growth, reconciliation in relationships, mobilization of gifts and callings, and an increased relevance to and participation in greater society. In the culture, this may be characterized by pervasive awareness of the reality of God, a radical correction of social ills, a commensurate decrease in crime rates (evidence of authentic biblical justice, as described in Isaiah 58), supernatural blessing on local commerce, healing of the brokenhearted (the alienated and disenfranchised), and an exporting of kingdom righteousness. To this end, a catalytic core of saints typically embrace a lifestyle of persistent repentance, humility, prayer and sacrificial servanthood that attracts the favor and presence of God, and breaks the predominating influences of the ruling power structures of human flesh and the devil. Emergence of the “City Church” – Clearly, the Holy Spirit is initiating an historic restoration of the geographic integrity and responsibility of the one Body of Christ in a city or region, calling leaders to walk together in the spirit of the Great Commandment, and work together to more effectively fulfill Jesus’ Great Commission. God is calling leaders to embrace a shared and sustainable vision to faithfully shepherd and disciple the collective souls of a city. This restoration requires a holy dissatisfaction with the status quo, a hunger to see Jesus’ prayer of John 17:21-23 fulfilled, and leaders who are bold enough to begin to “paint outside the box” of existing ecclesiologies. Post-crisis teams have been working on an innovative model to re-create the presence of the Lamb before the Throne. The results have been quite spectacular. We hereby formally announce the presence of a new Lamb in Heaven which matches the description of the Lamb in Revelations chapter 5. After full consideration of the meaning of these verses, our crisis team determined that it was important to illuminate the qualities of the Lion as described in verse 5. Every effort was taken to achieve the full effect of the Lion in Lamb’s garb, including the snowy white wool coat. Because we are rapidly approaching the Latter Days, the crisis team has chosen to emphasize the distinctive leonine attribute of roaring. A corresponding emphasis on the positive attributes of Sheep will be upheld in the Body to ensure future compatibility for the Lamb’s upcoming marriage. Because the Holy Spirit is currently inaccessible, we have engaged special task forces on Earth who will begin to perfect the Bride. Special criteria to designate what is clean, white and wooly have been developed and will be globally enforced. Our angels are presently sharpening their sickles for the final Harvest. Due to unforeseen mechanical difficulties with the transporters, our angels are unable to wield their sickles upon Earth at this time. In order to fulfill the quotas for the final Harvest, Prophets and Apostles are to begin whetting their swords and sharpening their sickles. Ongoing data transmission errors have obliterated the criteria for determining the difference between wheat and tares. Immediate preparations must be taken to devise valid sorting instruments on Earth. Prophets and Apostles are requested to begin assessing grain at once. *A special thanks to Pastor Ken Silva of apprising.org for his assistance with the graphic art in this post.